Preheat oven to 250° F and line a large baking sheet with foil or parchment. Set aside about a tablespoon of the sugar, and stir the cornstarch into the rest. In a large bowl, beat the egg whites with an electric mixer until soft peaks form. Gradually add the sugar mixture, beating until the mixture holds stiff, glossy peaks. Beat in vinegar and vanilla. To make one large Pavlova, spoon the meringue onto the baking sheet and spread out with the bottom of a spoon to form a 9”-10” circle with a slight indent in the middle and raised edges, like a nest. To make individual Pavlovas, spoon 8-10 mounds of meringue about an inch apart on the baking sheet. Bake for 1 to 1 1/4 hours, until crisp but still soft inside. If the meringues aren’t crisp, turn the oven off and leave them inside for another hour. Transfer Pavlova(s) to a rack and cool completely. Beat the cream with the remaining tablespoon of sugar until soft peaks form. 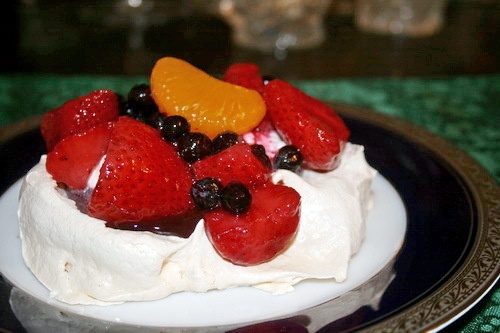 Mound into the middle of the cooled Pavlova(s) and top with fruit.